Nearly a quarter of the bones in your body are found in your feet. While small in size, they are mighty in strength and handle an incredible amount of stress on a daily basis. Bone is a strong substance designed to keep our bodies moving and endure a great deal of pressure. Even though we may often engage in activities believing that we are invincible, which is common with children especially, our bones have a limited ability to withstand each forceful impact. There are many situations in which the foot can endure too much stress and break—a fall, a collision with another player in sports, landing from a high jump, or dropping something heavy on your foot. Foot fractures are one of the more common injuries we see and treat at our office in Richardson, TX. A fracture is any sort of break in a bone occurring when the bone buckles under too much pressure. Any bone in your foot can break during a traumatic incident or a small crack can develop over time, which is called a stress fracture. The traumatic type, also referred to as an “acute” injury, can be stable or displaced. If stable, the ends of the bones on either side of the break are still aligned. If the break is displaced, the bones have shifted in alignment. With this type of break you will most often experience immediate pain and may even hear a sound at the time of the break. Bruising and swelling will develop, and in severe cases, you may visibly see the broken bones out of place. Stress fractures differ in the fact that the break happens over a period of time, typically due to overuse. Repetitive impact on the foot can cause a tiny, hairline crack to form in the bone as it gives way under the extreme stress. Runners and athletes in high impact sports are at risk for this type of foot injury, but wearing ill-fitting shoes, having an abnormal foot structure, and osteoporosis are contributing factors as well. It is possible in both situations, with a traumatic or stress fracture, that you could continue walking on your foot. If you have sustained an acute injury or notice chronic pain that is not improving, seek immediate treatment before the injury gets worse. This is not an injury in which “no pain, no gain” can apply. 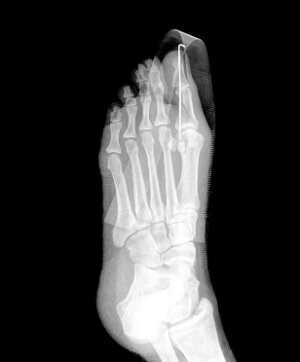 Just because you may be able to walk on your foot does not indicate that the injury on the inside is minor. If a fracture is not treated properly and then does not heal as it should, you could have chronic pain and possible surgery in your future. Dr. Gene Reister will provide treatment tailored to the nature and severity of your fracture. X-rays are often necessary to give us the clearest picture of the break. Removing weight off of the foot is usually the first step in the treatment process. Splints and braces are used for more minor fractures, whereas casts and boots are necessary for serious breaks. If a toe is broken, buddy-taping it is usually adequate to allow it to heal. With traumatic breaks, surgery is sometimes necessary to reset the bones back in place so that they heal in proper alignment. After the immobilization period, physical therapy can aid in restoring strength to the area and help prevent further injury. Anyone can experience a fracture - if you are suspicious that your discomfort could be due to a broken bone, don’t wait to confirm the diagnosis and get treatment started. Contact Dr. Gene Reister at Richardson Podiatry Associates with any concerns you may have. Make an appointment today by calling our Richardson, TX office at (972) 690-5374 or request one online.